In 10-inch nonstick skillet, cook pork over medium-high heat 8 to 10 minutes, stirring occasionally, until no longer pink; drain. Add chile, chili powder, cumin, cinnamon and salt; cook 2 minutes, stirring occasionally. Stir in raisins, 1/2 cup of the salsa and the lime juice. Remove from heat; stir in almonds and sour cream. Cool. Separate dough into 8 biscuits. Split each biscuit in half to make 16 rounds. On lightly floured surface, roll each round to 4-inch diameter. Spoon pork mixture evenly in center of dough. Fold dough over filling, pressing edges with fork to seal. Wrap in plastic wrap; refrigerate up to 8 hours. Heat oven to 350°F. Spray cookie sheet with cooking spray. Place empanadas on cookie sheet. Brush tops with beaten egg. Bake 15 to 20 minutes or until golden. Cool 5 minutes. 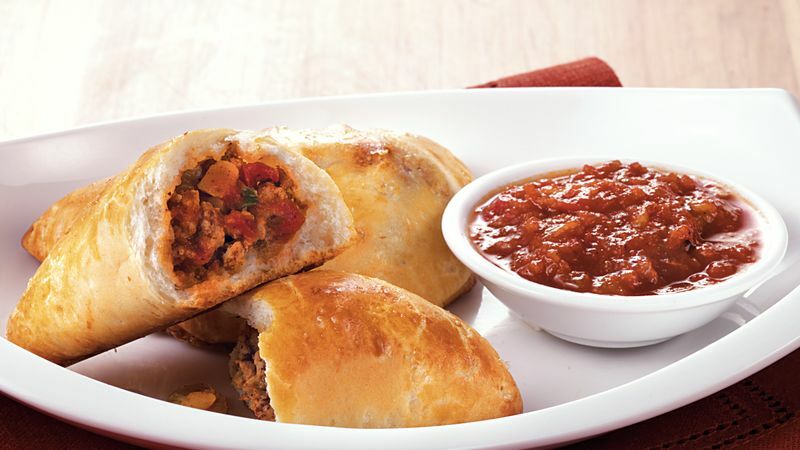 Serve empanadas with remaining 1 1/2 cups salsa.